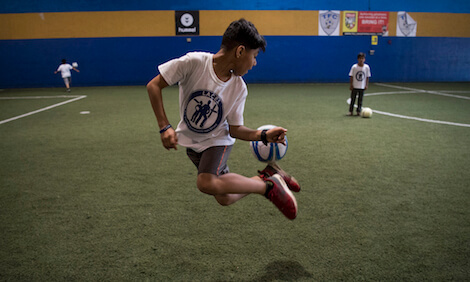 A boy from Afghanistan practices a soccer trick at the L.A.C.E.S. soccer camp in Landover, Maryland, in August 2018. A group in Maryland runs a soccer camp that helps refugee kids. Refugees are people who leave their home country because of danger. Sometimes the danger is war or a natural disaster. Refugees move to a different country where they can feel safe. Many refugee kids come to the United States with their families. The group that hosts the soccer camp is called L.A.C.E.S. The name stands for “Life and Change Experienced thru Sports.” Refugee kids learn skills at the camp to become better at soccer. They also make new friends. The camp gives the children a place where they feel like they belong. They learn to value and respect others at the camp. They also learn to be proud of themselves. Seren Fryatt from Indiana came up with the idea for L.A.C.E.S. when she played on a women’s soccer team in Liberia. Liberia is a country in West Africa. Liberia had problems with war for many years. Fryatt saw that playing soccer made her teammates happy, even though their lives were hard. She decided to start a soccer camp to help children in Liberia. After she moved back to the United States, she started the same kind of camp in Maryland. The coaches who work for L.A.C.E.S. are volunteers. That means they work without pay. The main goal of the group is to help children. L.A.C.E.S. does not make any money. The coaches work with boys and girls ages 9 to 14. They work on improving their soccer skills, such as passing and shooting. The coaches also teach the children skills to help them do well at school. Two 10-year-old boys from Afghanistan went to the soccer camp this summer. They came to the United States because of a war in their home country. They remember how scary the war was. It was hard to find time to be a kid with so many things to worry about. The boys are happy they can now feel safe at the L.A.C.E.S. soccer camp and play with other kids who are like them. Where did Seren Fryatt first get the idea to start a soccer camp for kids?